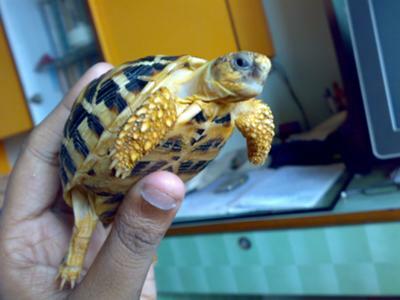 The only reliable way to know the age of a turtle or tortoise is to see it be born. However, we can make a guess based on the animal's size. In this case, the adult animal is about 10" long SCL. Yours sounds about 3.5-4" long, so a good guess would be about a year to 18 months old.